We’d love your help. 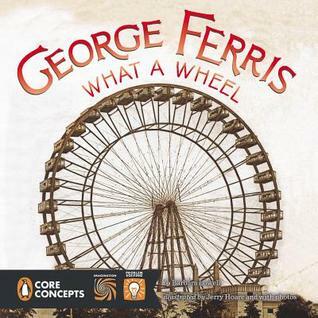 Let us know what’s wrong with this preview of George Ferris, What a Wheel! by Barbara Lowell. Have you ever ridden a Ferris wheel? You go up, up, up and can see for miles! But when the inventor of the Ferris wheel, George Ferris, first pitched the idea, everyone thought he was crazy. A 250-foot bicycle wheel that goes around and around and carries people in train cars? Can't be done, they said. But George proved them wrong. Read about how George's hard work, courag Have you ever ridden a Ferris wheel? You go up, up, up and can see for miles! But when the inventor of the Ferris wheel, George Ferris, first pitched the idea, everyone thought he was crazy. A 250-foot bicycle wheel that goes around and around and carries people in train cars? Can't be done, they said. But George proved them wrong. Read about how George's hard work, courage, and imagination created one of the most famous fair rides today. To ask other readers questions about George Ferris, What a Wheel!, please sign up. Be the first to ask a question about George Ferris, What a Wheel! Okay, when presenting info to children or adults please don't make it boring. Sentence structure here is poor and when one attempts to create a book or any item of art and has to stay with in a particular structure something of beauty is missing. There are facts here to be sure, but missing is the fact that George Ferris actually entered a contest to build something unique for the World's Fair in 1893. The text does feature several pictures from the actual construction of the wheel. No bibliogra Okay, when presenting info to children or adults please don't make it boring. Sentence structure here is poor and when one attempts to create a book or any item of art and has to stay with in a particular structure something of beauty is missing. There are facts here to be sure, but missing is the fact that George Ferris actually entered a contest to build something unique for the World's Fair in 1893. The text does feature several pictures from the actual construction of the wheel. No bibliography is given for some one to access more information. 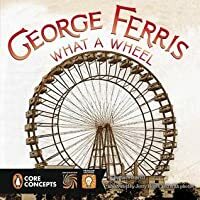 Recently I read another title about George and his invention of the wheel entitled Mr. Ferris and His Wheel by Kathryn Gibbs Davis. A much more interesting presentation of the same topic. Included in that title was a bibliography of various books and online sites for further information. Do you like? Sentence fragments! You will enjoy. This book? It's a lovely topic and idea, and this book indeed "exposes students to informational text", as it promises. I am less confident about its abilities when it comes to "English Language Arts and Literacy". If we are to provide kids with interesting books to read in order to "develop important cognitive skills", why not also provide them with well-written text? Lowell, Barbara. George Ferris: What A Wheel. The Penguin Group, 2014. 32 p. Gr. 1-4. Plot Summary: The biggest ideas can often be sparked by something quite ordinary and small, this was the case for George Ferris. As a respected engineer of bridges residing in Chicago, George decided to think outside the box and show everybody at the 1893 World’s Fair something spectacular that would out do even the great Thomas Edison, a Ferris Wheel. Despite his colleagues disapproval of what looked like a gia Lowell, Barbara. George Ferris: What A Wheel. The Penguin Group, 2014. 32 p. Gr. 1-4. Plot Summary: The biggest ideas can often be sparked by something quite ordinary and small, this was the case for George Ferris. As a respected engineer of bridges residing in Chicago, George decided to think outside the box and show everybody at the 1893 World’s Fair something spectacular that would out do even the great Thomas Edison, a Ferris Wheel. Despite his colleagues disapproval of what looked like a giant spider web, George was determined to make his invention big and strong enough for 2,160 people to ride on. The cold, windy city of Chicago gave George a run for his money, but George’s confidence was unwavering, he would get his creation up and running no matter the cost. In June of 1983, a month after the grand opening of the fair, George successfully completed his greatest invention and sold more than 1.5 million tickets. Unfortunately, in 1906 his Ferris Wheel collapsed due to an explosion, however his legacy lives on with Ferris Wheels all around the world still spinning. Classroom Connections: Spread across the last three pages of the book are interesting Ferris Wheel Facts, which could be used to help create lessons around. What A Wheel provides many large numbers, such as number of tickets sold, how much steel was used, etc. which would be perfect to use during a math lesson. Children could solve how much ticket prices back then cost compared to today’s prices, the difference in feet between the height of his first Ferris Wheel and the largest one in Singapore. There are many math related concepts to choose from throughout this book, perfect for a wide range of grade levels. Another idea is to have the students draw a Ferris Wheel with six cars on it, the same amount of cars that George hung on his trial run. Within each of the cars the students can write down six facts that they found interesting during the reading. The teacher can make a bulletin board in the hallway to display the children’s drawings for others to see as they pass by. Lowell, Barbara. George Ferris, What a Wheel!. Penguin Group (USA), 2014. 32 p. Gr. K-4. Students are introduced to George Ferris, the engineer who invented the Ferris Wheel in 1893 for the Chicago World's Fair. Book art includes a unique mixed-media overlay style of photo on print. The text briefly introduces Ferris' early life as it relates to his inspiration for the Ferris Wheel and progresses through design, approval, financing, problem-solving, and building processes as the wheel goes from concept to completion. The biography is a 'Penguin core concepts' book, which meets the 'Common Core' standard concepts for Imagination and Problem Solving. This book was specifically written to address the Common Core Standards, complete with guided discussion questions. That is usually a tip-off that a book is less than a literary or artistic treasure. But this proved to be a really interesting story about George Ferris's quest to build a world-class attraction for the 1893 Chicago World's Exposition. A story of math and science and also persistence and determination. It was an incredible accomplishment! Very informative, yet enjoyable. Loved this story! the illustrations, together with the actual pictures really help enhance the fantastic story of how this magnificent wheel came into being. Very well written! Loved the illustrations mingled with original photographs. There are some interesting facts about George Ferris and his invention of the ferris wheel.